Today, I found myself alone in my house on a rainy afternoon. As I sat down to contemplate what books would be worth discussing today, Christopher Robin, dressed in raincoat and hat, moved into my mind and refused to budge. Now, I realize that many of you know Pooh, Christopher Robin and the rest of the gang, but do you remember the details of the original story's chapters? The more I focused on Christopher, outfitted for the rain, the more the wheels of my memory set to work and finally, I was delighted to remember the boy and the bear floating down the creek in an up turned umbrella on their way to save Piglet. With this memory in tact, I headed to the bookshelf. 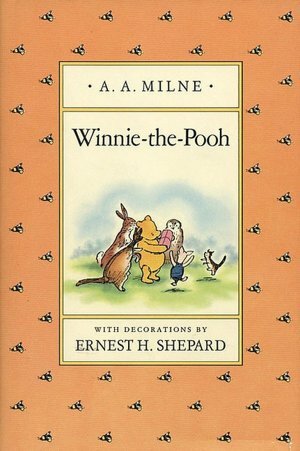 From it, I pulled my childhood copy of Winnie-the-Pooh and began to read; both book and story are treasures to me. I smiled as I reconnected to the love shared between all of A.A. Milne's characters. My heart sang as the memories of time spent with my son, sitting on my lap as we rediscovered Pooh day after day, came rushing back to me. So, for today, no matter how old your reader is, or the kind of weather you are having, I challenge you to step carefully into Christopher Robin's umbrella and help he and Pooh rescue Piglet. I think we just might read aloud chapter nine of Winnie-the-Pooh, "In which Piglet is entirely surrounded by water," tonight. Hopefully it will act as a time machine and transport us back to our days of snuggling and reading.